For those of you out there with demonspawn and alien hybrid offspring, you know it’s a challenge to find good books for them to read. Now Sword and Laser Kids has come to your rescue. This new Goodreads group, based on the original The Sword and Laser book club, is geared towards a younger audience. The first pick is Rump: The True Story of Rumpelstiltskin by Liesl Shurtlif. The forums are open, so if you’re a parent of an elementary-aged berserker or space cadet, consider joining in on the discussions there. 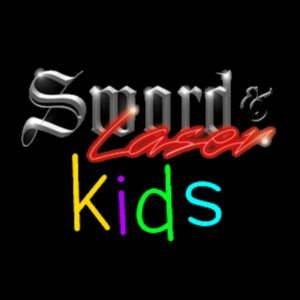 Sword and Laser Kids is a public group so anyone can join. There is even talk of a podcast in the works so this is definitely one to watch. The project is the brainchild of Jim Randolph (a.k.a. library_jim), an elementary school librarian. If you are interested in helping and have experience with children’s literature, you can contact Jim through the Goodreads forums. Rob (yes, that Rob) has signed up as moderator and tech-support, but they could always use more help. In any case, be sure to add Sword and Laser Kids to your Goodreads groups so you don’t miss out. Note: We’ve added the link to our menu bar above. This is the home of the Foil & Phaser writers workshop, a spin-off community website for fans of the Sword & Laser book club and podcast who want to develop their writing skills. Thanks so much for the mention and the support! Not a problem. I saw the website literally seconds after I posted this, so I added that on the end. If you need any help with WordPress or setting up social media accounts, let me know. I know how much work it is to start a new project like this. Good luck!